Vox Cantoris: Archbishop Daniel Bohan - what are you thinking? Archbishop Daniel Bohan - what are you thinking? There are times that it is nearly impossible to believe the absolute evil and distortion of the Truth promulgated by some Shepherds. Now, it is Bishop Daniel Bohan, the Archbishop of Regina. This in-depth article by Pete Baklinski at LifeSiteNews must be read and shared. Aside from the obvious about the event allowed by this bishop to take place was his absolute refusal to answer the legitimate questions on the matter by LifeSiteNews stating "journalistic incompetence and inability to accurately report events." You can read the facts as reported at LifeSiteNews. 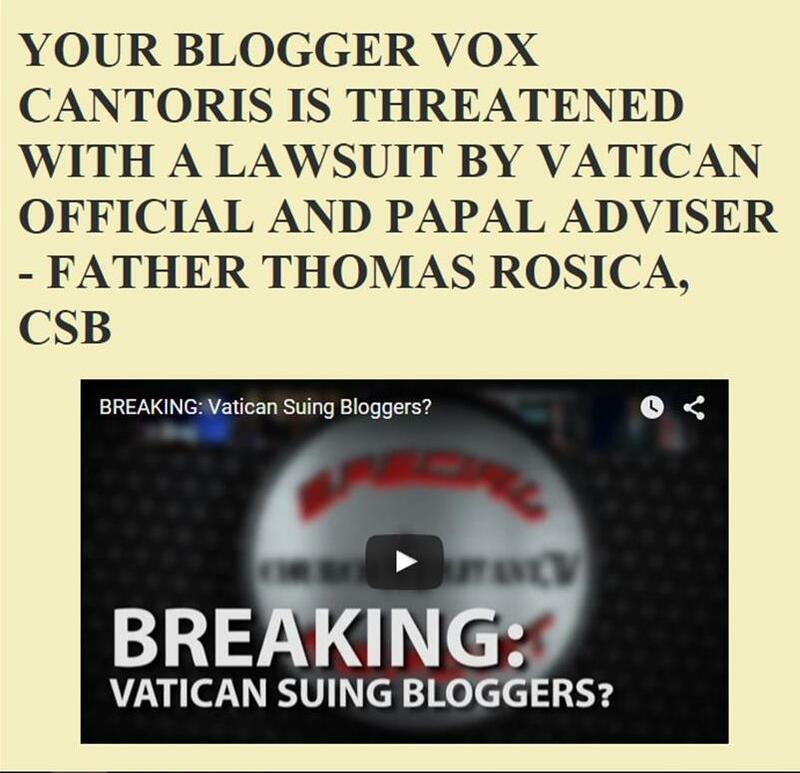 Coincidentally, Voris' video today speaks to the broader issue of the homosexualist mafia and the coming persecution. It is posted at the bottom of the article. REGINA, Saskatchewan, May 7, 2015 (LifeSiteNews.com) – The Catholic archbishop of Regina, Saskatchewan, Daniel Bohan, welcomed gay activists to his Cathedral hall in March to guide about 75 Catholic teachers in creating a policy on care for “transgender” students. The event, which the archbishop attended and said he was “pleased” about after the fact, was keynoted by a Catholic priest who tells LifeSiteNews that he disagrees with Church teaching that humans are created male and female. Panelists at the March 20 event on the “pastoral care for transgendered students” included LGBTQ activists and a trans couple consisting of a biological man and woman who now both look like and claim to be women. The keynote speaker at the event taking place in Holy Rosary Cathedral Hall was Redemptorist Catholic ethicist Fr. Mark Miller. He was an auxiliary bishop in Toronto for two years. I had the impression he was a mediocre bishop but this incident suggests he might just be downright hostile to the best interests of the Church. It would seem that Toronto is a training ground for mediocre auxiliary bishops who are then shipped out to other parts of the country. This will probably be my last comment here. Beating around the bush regarding the progress of lies in the Church - an attitude too many choose, is a waste of time. All these bishop and cardinals are part of a hierarchical structure with a pope at the top. The pope could quickly put and to it at any time. He could stop the coming persecution. In reality he is unfaithful rather than a little odd. In reality this ship is sinking, all while the captain is on the first pages of magazines, while he is kissing all kinds of feet, while he is secretly making peace with murderous communists (ignoring murder is NOT mercy toward those murdered and their survivors, but a moral degeneracy), while he is praying in his gardens with worshippers of false gods, while he talks about moving toward the light and about forgetting the dark past, like some New Age false prophet, NOT a follower of Jesus. Darota, I would be sorry to see you not comment here. Yes, the Pope could stop this tomorrow but he won't which is why we must continue no matter how hard and frustrating it gets. I was pushing my little son in the stroller a couple of months ago and a very joyful ninety year old stopped to speak with me. First she assumed i was muslim i guess because she spoke about members of ISIS as once being little babies. Little babies who have lost their way. Then she asked me if I know Jesus. i said yes i know Him. Then she asked but are you born again. i said yes i am baptised. then she said that is not good enough, you need to be born again. Then she was telling me a list of protestant preachers that i should listen to. then she said "You know the current pope is no good. He is the false prophet." I agreed and she was surprised. She said 'Oh you know!' So even this ninety year old belonging to the Salvation Army is able to spot a wolf in sheeps clothing.